Luis Segundo Correas Vineyards and Winery are personally maintained by its owners, fourth generation of this traditional family of wines, who believe that the origin of the quality of wines begins in the vineyards. The family owns 400 hectares of vineyards, some of which are 70 years old, distributed between 8 States. The “Fincas” are “San Luis”, “Doña Ofelia”, “La Verde”, “Don Angelino”, “La Esperanza” and “El Tata”, are in the district of Medrano, at 850 meters above sea level, “Finca La Julieta” at 800 meters above sea level in Maipu, “Finca Las Marias” at 870 meters above sea level, where we have the following varieties: Malbec (130 has), Cabernet Sauvignon (50 has), Merlot (20 has), Syrah (20 has), Sangiovesse (30 has) and Bonarda (20 has) in red wines; Chardonnary (50 has), Sauvignon Blanc (20 has), Semillon (20 has), Tocai Friulano (20 has) and Torrontes (50 has) in white wines. 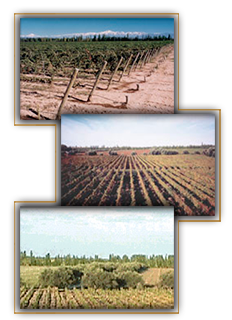 All the vineyards are placed in “The First Zone”, where the soil and weather are special for viticulture. Engineer Agronomist Julian Correas controls the production to assure quality. He determines the pruning to achieve optimum quantity, supervising the process of pruning as well as the stripping of the leaves that will allow the necessary sun and a strict sanitary control of every wine-stock, in order to define those clusters that by their position and quality, await precise ripeness. Harvesting is manual and placed into small, plastic containers to avoid oxidation. The vineyards are watered entirely by de-icing water from the mountain range of the Andes.